Did anyone watch the SAG Awards last night? Even though "Brokeback Mountain" did not win the award for Outstanding Performance by a Cast, Jake and Heath were reponsible for the night's best performance while presenting the movie. And after coming across this moment between Ryan Phillippe and Matt Dillon, I am hoping for a Brokeback sequel. Istoé Gente magazine has an exclusive behind-the-scenes look at a day in the life of Anna Wintour's favorite Brazilian, Carol Trentini, during São Paulo Fashion Week. Along with Solange Wilvert, Carol is probably the hottest Brazilian model right now. The 18-year-old either opened or closed every major show last week in Brazil, cashing in R$250,000. The marathon of shows continues later this week in New York. How appropriate! Thanks to Argentine reader Gaston for sending his pictures to Speedo Sundays. There is one more after the jump. Missed the shows this season? 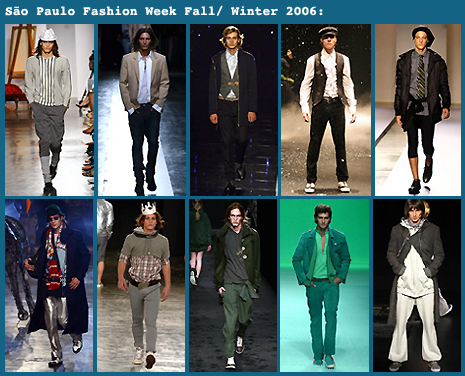 Here are all the links to the best menswear looks presented at São Paulo Fashion Week so that you can already start obsessing about what to wear a year from now. I was browsing through pictures taken by my friend Phelipe in Rio, and when I came across these ones I knew I had to share them with you. Have a good weekend!